This album was recorded at McCartney's private studios in Rye (The Mill) and Campbeltown (Spirit of Ranachan - former Rude Studio) between June and July 1979. Wings did not participate in any of the songs. Another poor Optimal pressing. Both copies I saw had variable degrees of non-fill/cold-fill on at least 3 of 4 sides. A great collection if you’re into weird early 80s experimental synth pop (esp. if you like the sound of “temp secretary”, bogey and “frozen...” off the single disc original, there’s “check my machine”, “bogey wobble”, “secret friend”), but the CD might be a better option until this gets pressed with better QC. My 2nd record's side 1 is badly off-center. Anybody else? My copy has 1980 on both sides but everything else is the same as shown. I am missing the 7" single to verify that, it's disappointing considering I have the sleeve for the single just missing it. It took me a while to find this, this is the version I have as well. I want to point out that along with the MPL logo being in a different place, this version also has the year as 1973 on Side B, while Side A has the correct 1980 year. Got one with TEAM TRYKK OSLOon back sleve, indicating Norwegian pressing. Same label number as Swedish pressing. Much like its predecessor (1970's McCartney), this album marked a turning point for Paul McCartney. 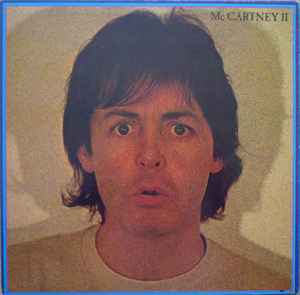 Recorded during a Wings hiatus, and released after his drug related arrest in Japan, McCartney II showcased the musician again on his own, with inputs only from wife Linda and a few studio technicians and engineers. This deluxe/limited book edition, the "third release" in the Paul McCartney Archive Collection of expansive remasters and reissues, far outpaces both Band on the Run and McCartney (releases one and two) as part of that collection, simply by the amount of bonus material included. The remastered album shines due to the meticulous care of Abbey Road personnel, the same team that worked on the other Archive Collection releases, but also the 2009 Beatles remasters. Fans of the original album would be very interested to hear the bonus material presented in this edition, namely the extended cuts of various songs featured on the original album (its reported McCartney's American distributor in 1980, Columbia Records, ordered the cut downs, including plans to make the album a double record). Furthermore, the bonus materials include McCartney's 1979 Christmas single and tracks recorded at the same time, planned for other projects, and ultimately not released: namely "Blue Sway". That being said, the expansive bonus material on this release might not attract the casual McCartney fan, or the fan unfamiliar with the seemingly long out of print McCartney II, and those fans should seek out the one or two-disc versions of this remastered edition.